​Sway start their season with a double header at home to Upham on Saturday. The First Team will continue to be led by Stuart Doling, Matt Dunford and Ben Johnson but they are now joined by Dave Gray who has moved across from Upham. For the Reserves, we welcome the entirely new management team of Jimmy Plowman,Ted Allott and Ross Boon. The first match kicks off at 2pm. As usual the Jubilee Field bar will be open to refresh supporters. In the coming weeks we have more friendlies as we prepare for Hampshire Premier League football which kicks off in August. We have two more home games against Lymington and Hamworthy Rec followed by another double-header, this time away to New Milton. Following a successful appeal with Hampshire FA, Sway FC are pleased to announce that we will be competing in the Hampshire Premier League next season. As Bournemouth Manor rapidly took control under the floodlights, Sway fans were soon left to reflect on what has been a great season for the Reserves. They not only reached the final of the Senior Cup but finished second in Division One of the Bournemouth League following an unbeaten run that stretched back to November. The lads rallied in the second half, despite being 5-0 down, and came close to a goal when Bill Stride so nearly put away Joel Fields' cross. But the result was never in doubt. Sway's run of fifteen games unbeaten was brought to an end in a feisty game at Netley Central. The result leaves Sway top of the league but with Four Marks just one point behind with three games in hand. The date for Sway Reserves' semi-final clash with Parley Sports from the Bournemouth Premier League ​has been set for February 4th. The M.A. Hart Poole Bay Cup tie will take place on neutral territory at the George Vth Playing Fields, Pitch 1. The Reserves last reached a semi-final in 2013 when they beat Old Oak Medians 6-1 in the Page Croft Cup for the lower Bournemouth Hayward League divisions. They went on to win the Cup. Sway FC have appointed ​Stuart Doling and Matt Dunford as the new management team for our Hampshire League First Team. Stuart and Matt first met when Stuart became first team manager at Wessex Premier League team Lymington Town FC in 2010. Prior to this, Stuart had played football at the top level, having appeared for Portsmouth in the Premier League in the 1990s. He also played for Doncaster and latterly for what was then Lymington &New Milton FC. Stuart has managed other teams locally but stepped back in the last two years to concentrate on his fruit, veg and flower businesses. Matt played in local leagues, including a season with Maybush, in what was the Hampshire league at that time. He went on to be a very successful manager with Southampton Football League team Spartans FC, taking them to the final of the Southampton Senior Cup in 2006 which was played at St Mary's. Since then, Matt has held other management positions including time at Andover Town and recently at Infinity FC who compete in Hampshire Premier League. Stuart and Matt will work alongside Sway stalwart Ben Johnson and look to build on the potential of our current squad as we strive for promotion to the Hampshire Premier League. The Reserves threw away a two goal lead after Tom Linbourn and Joel Fields scored. But considering that they beat us 6-2 in our home fixture, this was a great result against a side who have only dropped five points all season. Sway's attacking style paid dividends as they put five past Petersfield with goals from Ryan Brading (2), Darren Ritchie, Jake Bockhart and Ben McQuoid. Equally pleasing was the clean sheet, our third in a row. With Upham losing 1-0 at Netley we can move to within two points of them in second place if we win our game in hand. After journeying across the Solent, Sway came up against a very good side and faced an uphill struggle right from the kick off. In the end the lads did well to restrict the home side to just four goals. Time to focus on the league! Chairman Andrew Blackwell has taken over as Interim Manager of the First Team following the resignation of Dan Marks due to work commitments and for personal reasons. Andrew commented "Obviously we're very sad that Dan has resigned but totally understand the reasons behind his decision. Dan's done a great job for us, taking over when the team was struggling in the Bournemouth Premier League and guiding us to a title challenging position in the Hampshire League. I'm very pleased to report that Dan will continue being involved with the Club in a playing capacity. I will be taking over managing the First Team on a temporary basis with Ben Johnson as my number two." Mimicking their First Team counterparts, the Reserves also went behind before running out 5-1 winners. The Sway scorers were Limbourn (2), Stride, Frankcom and Witthorn. The U18s got off to a difficult start, conceding a goal in the first ten minutes. But the lads began to get back into the game and created plenty of opportunities to score. However, the Hiltingbury Hammers were ultimately too strong and went on to score three more goals. 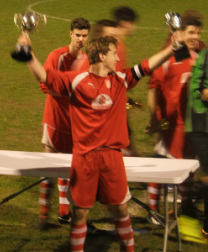 Captain Jake Fields was man-of-the match. The Reserves continued their pre-season preparations with a local derby at Jubilee Field. Fans were treated to a nine-goal thriller as Pennington were put to the sword with goals from Brennan, Linbourn, Roberts, Herbert, Forbes and Stride. Sway looked the better side for most of the game and led 2-0 for most of the game but Burton finished strongly, scoring four goals in the last 15 minutes. Sway's goalscorers were Ryan O'Reilly and Jordan Rodgers with his second brace of the season. Playing our second game in less than 24 hours, Sway were able to draw on their increasing resources to field a team with only three of the Friday night squad. The Reds held a first-half lead following a good strike by Joe Petty. But midway through the second half, New Milton equalised and in the dying minutes scored their winner to inflict our first defeat of what has been a very impressive pre-season. Dan Brennan curled in a wonderful strike in the final moments to tie the game against a strong Lymington side. After a goal-less first half Lymington went ahead soon after the restart only to give away this lead with an own goal. The visitors eventually broke down Sway's well organised defence before Brennan delighted the home fans with his wonderstrike. In the penalty shoot out, Lymington failed to find the net in three attempts: over the top; hit the post and saved by Josh Borrowdale. With our players scoring all three attempts, Sway secured the Chris Sirl Memorial Trophy for the first time with the fastest possible shoot out. Sway FC have moved quickly to appoint new managers following the departure of both the Reserves and Under 18s managers to Brockenhurst FC. ​James Crouch will head the Reserves with assistance from Steve "Fudge" Hillyer and Chairman Andrew Blackwell. Sway FC Chairman Andrew Blackwell said "James and Fudge are currently playing in the Reserves and bring with them a wealth of knowledge and experience which I am sure will be a huge benefit to the younger players." From next season, the U18s will be headed up Steve Drayton, the current manager of Sway Juniors U16s, with Matt Hillyar and Ben Sirl responsible for coaching and team matters. Two weeks ago Sway Reserves managers, Chris Groves and Paul Nineham, together with U18s managers, Ben Howlett and Luke Hirst, tendered their resignations, as did administrator Phil Fairhurst and photographer Steve Smith. Andrew Blackwell continued "With less than two weeks gone since receiving the resignations I am delighted that the swift actions of the Committee have had such a positive outcome and we all feel very positive towards the future. However, the Committee were very keen to stress that they wished to thank all those concerned for all their efforts over the years and to wish them the best of luck in their new venture." The U18s will continue to be managed by Ben Howlett and Luke Hirst until the end of the season. Sway just couldn’t seem to impose their normal style on the game and failed to have any particularly threatening spells of possession, getting unstuck by Winchester City’s constant tactic of playing the ball over the top of Sways back line. Citys first goal came within 5 minutes from a set piece which wasn’t dealt with. Sway had a good chance to make things level with an indirect free kick, in City’s penalty area, but it was well blocked. City extended their lead and Sway went into halftime 2-0 down. The management changed the system to 3-5-2 for the second half in an effort to give more structure at the back and more numbers up top. This formation change certainly improved Sway and they played better, with City threatened a lot less, however Sway failed to create any decent chances, and unfortunately came unstuck again with about 15 mins to go as we went 3-0 down. To top the performance off we failed to set up an effective wall for a free kick 20 yards out which led to the fourth goal. Sunday's Hampshire cup fixture result was awarded to Sway after the visitors could not field a side. Therefore the U18's are in the hat for the next round. They started very brightly and were rewarded with the lead after just 4 minutes. A superb cross field pass from the right wing from Haffenden dropped over the head of the retreating defence and Stride judged the pass perfectly to control with his first touch and stroke past the keeper with his second. Sway were in total control of the game and Chillcott was unlucky not to extend the lead first with a header following a Hillyer free kick and then with a 25 yard effort. Haffenden was also unlucky as when set up by Stride the Redlynch keeper saved well. Sway doubled their lead just before the break when Chillcott's incisive pass sent Stride away. He drifted past his marker before cutting inside the last defender before being bundled to the ground for a clear penalty. Haffenden stepped up to fire past the keeper, only for the referee to insist on a retake as someone had encroached into the area. Haffenden though kept his cool to fire low into the same spot. Sway worked hard and defended well in the second period as Redlynch tried to force their way back into the game. With the experienced Ritchie and Gates controlling the midfield Sway never looked like giving away the advantage and when they attacked always looked likely to extend their lead with Hillyar and Haffenden supporting the forwards at every opportunity. Sway's task was made slightly easier when Redlynch had a player dismissed for receiving 2 yellow cards. The Redlynch keeper was keeping his side in the game with great saves from Haffenden and Clark when each was put through on goal and a fantastic point blank save from a Hillyar header. In the final action of the game substitute Tang was adjudged to have tripped the Redlynch forward just inside the box giving the referee little choice but to award a penalty. This was converted with the last kick of the game to give Redlynch a consolation and prevent Sway recording a well deserved clean sheet. Sway started brightly and were unfortunate not to go ahead in the opening 5 minutes when Marks put Wright through on goal but his shot across goal went narrowly wide. Shortly after Broughtons defence failed to clear a corner and the ball fell to Whitthorn who again shot just wide. Broughton started to look dangerous on the counter with Rankin and Vidler, who were the top goalscorer in the Hampshire league last year, both looking sharp. Despite the warning signs Brennan and Gilbert were caught square once too often and Vindler found himself one on one with Langdown in the Sway goal, when trying to round the keeper Langdown was adjudged to have fouled him conceding the penalty and a yellow card in the process. Vindler then proceeded to convert the penalty sending the keeper the wrong way. Literally straight from the kick off Sway lost possession, the Sway defence was caught square again and Vindler race through and hit an unstoppable shot into the top corner. Sway reduced the arrears 10 minutes into the second half when an attempted clearance was smashed into the shins of Whitthorn and rebounded into the corner of the net. Disappointingly, from the kick off Broughton were allowed to race up the field and score without a telling challenge being made, to restore the two goal difference. Play was then very much end to end with both sides creating chances during this spell Langdown made two stunning saves to deny the home side going further ahead. With 20 minutes remaining Wright whipped over a corner and Whitthorn rose above the home defence to score with a superb header. Sway then through caution to the wind in search of the equaliser but were undone when a speculative shot from 25 yards slipped through Langdowns hands and agonisingly dribbled over the line to effectively end the game. Sway travelled to last year’s Premier League champions with ten squad players out through injury or on holiday. They could have been out of the game in the opening 25 minutes had it not been for some very poor finishing by the Hamble forward line and some excellent saves by Langdown in the Sway goal. As it was they only found themselves trailing by a single goal scored after 15 minutes. Sway then came more into the game with Petty and Booker controlling the midfield and James causing the home defence problems down the right flank. They had two great chances to draw level: firstly a through-ball by Marks put Duncan through with seemingly just the goalkeeper to beat only to be denied by a last ditch tackle. Just moments later, James also got in behind the Hamble defence only to see his lob shot drop short and in his efforts to bundle it over the line he pulled his hamstring. Sway started the second-half strongly and it was no surprise when they equalised. Rhino's excellent free-kick found Brennan whose super header found the corner of the net. Midway through the second-half the home side’s superior fitness started to kick in with Sway very much on the back foot. On 70 minutes Whitthorn, standing in at full-back, was adjudged to have handled inside the box and Hamble duly converted from the spot. This opened the floodgates and a further three goals were scored within the space of the next ten minutes. This was a brave and spirited performance by Sway against a very good Hamble side. Sway: Langdown, Whitthorn, Brennan, Gilbert, Rhino, James, Booker, Petty, Limbourn, Duncan, Marks. Sway Reserves suffered defeat for the second consecutive week at Jubilee Field when Bournemouth Sports recovered from 3-0 down to shock the irhosts. For the first 30 minutes Sway dominated the game and put the visitors under constant pressure. Their reward came after 10 minutes when Adam Clark pounced on defensive uncertainty to fire low past the keeper into the corner of the goal. A second goal came soon after when a superb free kick from Clark was headed home by Elliott-Haffenden after Hillyar had been fouled by the half-way line. Hillyar then missed two good chances to get his name on the score sheet before an excellent team goal extended Sway's lead. Good interplay down the right-wing between Hillyar and Quinn set up Haffenden to deliver a great cross that Stride coolly controlled before sliding the ball past the advancing 'keeper. At this point there was only one winner with Sway dominant. Two further chances fell to Hillyar but again these could not be converted. The game was then turned completely on its head as Bournemouth Sports scored three times in the last 10 minutes of the half to go into the break on level terms. Twice they converted after through balls dissected the flat Sway back four and a further goal came from a fine header. The second half started at a much slower pace with Sway trying to regain the control of the game that they had thrown away. Haffenden nearly restored their lead when put through by Quinn. However, the longer the game progressed the less dangerous Sway looked. Sway Reserves: J Barrowdale. S Quinn. S Hillyer. D Larcombe. J Langdown. B Haffenden. A Clark. P Cole. T Braime. B Stride. M Hillyar. Subs: L Miller. M Schisan. A cup fixture against conference side Eastleigh’s U18’s side was not going to be easy but playing on a horribly small & bumpy pitch at Southampton Outdoor Centre compounded the issue. From the first corner Eastleigh took the lead, then keeper Eaton came to Sways rescue several times. Poor defending let in the winger to increase the hosts lead. Bale was sent on and soon rallied Sway but he limped off minutes later with another injury. Then another goal was conceded from a corner. Sway created several half chances but it was the home side that looked more comfortable and extended their lead again. Excellent work from the ever impressive Shorey saw his penetrating run end with a shot which crept the wrong side of the post. A stern half time team talk spurred Sway into action with attack after attack failing to trouble Eastleigh, who replied with another goal, then another. Eastleighs final goal came from a curling free kick which eluded all players, including the keeper to end up in the net. Sway: Eaton, Shorey, Falso, Langdown, Weekes,Chown, Bateman, Drodge, Worrall, Baxendale, Thompson. Sway enjoyed a productive start to their opening league fixture at home to Wessex League Fareham Town FC’s U18s. Early pressure saw Thompson releasing Worrall but his shot was just wide. Both teams began to play good football but neither troubled the keepers as both defences stood firm. The visitors opened the scoring midway through the first half when a midfielder rode several tackles to unleash a fierce swerving shot which keeper Eaton was unable to stop. Sway tried their luck with several promising attacks to no avail. Langdown recovered well after his poor free kick put the home team under pressure from an attack, then Fareham's keeper then made a series of crucial saves to deny the home team an equaliser. The visitors went ahead again after Weekes' last ditch tackle saw the ball spin agonisingly into the bottom corner. A constructive half-time team talk spurred Sway on and Hinz headed wide when it looked easier for him to score from a corner. Pearce-Eavis threaded a sublime ball through to Baxendale who calmly chipped the ball over the out-rushing keeper to score Sway's first goal of the season. Continued pressure gave the Reds another corner, this time Chown slammed a header into the net for the equaliser. The home side were now full of confidence and went in search of a winner with Bale and Chown going close. Fareham were not out of the game and also pushed for the winner but Sway's defence stood firm, especially ‘man of the match’ Shorey at right back. The full-time whistle sounded and the new management team were more than happy with the squad's performance but disappointed not to get the win that was surely ours with better finishing. Next week Sway travel to Conference side Eastleigh FC to play their U18s in the League Cup. Sway Reserves started their season with a tough home fixture against a strong Bournemouth Manor Reserves. Manor were the first to threaten and their bright early start was rewarded after 10 minutes when, after Sway had cleared a dangerous corner, the ball was returned into the box by a fine right wing cross and headed powerfully home. Sway nearly replied immediately when Steve Hillyer blazed over after a scramble in the Manor penalty area following a corner won by Haffenden. Sway were now starting to dominate possession and with this the chances started to come their way. They were unable to convert any of these, however, as Matt Hillyar just failed to connect with a good cross from Clark and Quinn had a scrambled effort cleared off the line. Haffenden had two dangerous free kicks saved, the second of which came loose to the on-rushing Larcombe who somehow managed to miss the target with the rebound. Sway were unable to maintain this momentum in the second period and Manor continued to look dangerous on the break. Keeper Barrowdale produced two fine saves to keep Sway in the game but the chances at either end were few and far between. Stride and Haffenden both had speculative long-range efforts but the game was settled after 70 minutes when a long goal-kick from the Manor 'keeper caused problems in the Sway defence and the striker pounced on the uncertainty to score. Hard though they tried, Sway were unable to force their way back into the game which ended with a 2-0 victory to Manor. Sway Res. J Barrowdale, S Quinn, S Hall, S Hillyer, D Larcombe, A Clark, T Ritchie, A Gates, m Hillyar, B Stride, B Haffenden. Subs: L Miller, J Elliott. Sway found themselves behind in controversial style when after only five minutes the Netley centre-forward slotted home after bundling Fairhurst off the ball. Despite strong appeals from the Sway players the goal was allowed to stand. Sway then dominated for long spells and should have drawn level midway through the half when Douik worked it down the flank crossed to McQuoid who unfortunately headed straight at the keeper. The Reds continued to press with efforts by Booker and the influential Petty going narrowly wide, whilst at the other end Netley only had one shot of note on target which was well saved by Langdown. The second half followed a similar pattern with Sway dominating play and Netley restricted to counter attacks from long balls out of defence. The danger signs were there when Sway were caught out with one such attack and only an outstanding save by Langdown denied Netley from going further ahead. The game was settled with 15 minutes remaining on the clock, with Sway desperately searching for the equaliser when they were again caught out on the break and this time Netley weren’t to be denied when a cross ball was converted from close range. Sway notch up first win! The opening 20 minutes was very even with both sides creating good chances only to be thwarted by some excellent saves. Sway broke the deadlock on the half hour: Wright skipped past two defenders and sent over a superb low cross which was met by Booker who thumped home a low drive from the edge of the 18 yard line into the corner of the net. Two further goals soon followed with the industrious McQuoid out-jumping the goalkeeper to head home the second and the mercurial talented Limbourne hitting a 25 yard bullet for the third. Just before the half-time whistle Gilbert made an outstanding last ditch tackle to deny the Michelmersh centre-forward who was clean through on goal. Michelmersh made their intent very clear early in the second half with several crunching tackles earning yellow cards and were soon reduced to nine men with the referee brandishing two red cards. Sway kept their discipline under extreme provocation and were rewarded with a fourth when the ever-youthful Davis coolly rounded the keeper and slotted home. Managers Dan Marks and Nathan Lucas were delighted with how their new team is shaping up with new signings from Bashley - Booker, Petty and Taylor - all having excellent debuts. On the negative side, Johnson and Blake picked up nasty foot injuries and Wright suffered a groin strain. Sway: Ryan Shepperd, Ben Johnson, Lee Gilbert, Dan Brennan, Lee Taylor, James Wright, Dan Fairhurst, Joe Petty, Tom Limbourn, Ashley Booker, Ben McQuoid. Subs used: Alex Davis, Matt Blake, Dan Marks. Neither side could find the net in the first half with Petersfield coming closest with a shot against the bar. Sway went ahead early in the second half with a cracker of a goal from Kev James who used his strength to break into the penalty box and drive past the keeper. This fired up the Reds who found their passing game and created several more chances. James Wright struck the bar but it bounced down just in front of the line. Later on he was put through on goal but his shot agonisingly rolled onto the post. Meanwhile, Petersfield began to threaten our goal and went close from corners on several occasions. Sway were pegged back and came under even more pressure when Dan Brennan was sent off for a second offence. Petersfield grabbed the equaliser with almost the final kick of the game, surging through from the right, leaving the 'keeper no chance. Sway were on top early on with Adam Clark forcing a good save from the Boldre 'keeper. But the visitors went ahead, lobbing 'keeper Josh Borrowdale after a ball over the top. Sway replied immediately through top scorer Ben Elliott-Haffenden but went behind again when another long ball was inadvertently knocked on to the Boldre striker. The introduction of fan's favourite Alex Davies added vigour but the Reds went further behind after a defensive mix up. Elliott-Haffenden grabbed his second after good work down the left from Rory. Sway's come-back game in the Hampshire League ended in defeat despite a good performance. Dan Whitthorn equalised just before half time after the Lions went ahead. The game looked to be heading for a draw until the visitors took the lead in the 82nd minute. As Sway searched for an equaliser they were unlucky to concede a third just before the final whistle. Two from Billy Stride and a double brace from Ben Elliott-Haffenden gave Sway an emphatic victory at this Jubilee Field friendly. After a goal-less first half, both sides made substantial changes to personnel. Haffenden came in from the left early on to put the Reds ahead. Then Matt Hillyar put Stride through for the second. And there was no stopping Stride as he helped Haffenden get two more for his hat-trick and grabbed his second with a sublime chip. Haffenden grabbed his fourth following a through ball from Mike Tang. Sway have been drawn away to Bournemouth Poppies Reserves in the Pickford Cup. A date for our visit to Victoria Park is yet to be announced. Before then we will welcome Bournemouth Manor Reserves for the first Hayward League game on 5th September at Jubilee Field. Sway have been drawn against the top two teams from last season's Hampshire Division One in the Hampshire Intermediate Cup. The Senior Team have been drawn away to Netley Central Sports First Team whilst the Reserves have a home draw against Infinity. Infinity gained promotion to the Senior Division whilst Netley remain in Division One. The fixtures are to be played on Saturday 3rd October. The Under 18s have a home Hampshire Cup fixture against Fleet Town Under 17s on Sunday 20th September. Both Sway teams won 2-1 in the heat at Jubilee Field. The First Team had goalscorers Tom Linbourne and Zinedan James to thank for their victory. The Reserves went a goal down after ten minutes but continued to play their passing game and were rewarded with goals from Sam Roberts and Ben Johnson to go in at half time leading 2-1. Bournemouth looked much stronger in the second half but good defensive work allowed the Reserves to hold on for their second pre-season win. A good crowd witnessed a lively encounter between Sway and Lymington with the Wessex League team ending up winning four nil. The match was held in honour of a Chris Sirl who sadly passed away in December 2014. Chris was a football lover and was often seen cheering on the Reds at Sway’s Jubilee Field. After the match, Chris’s wife Cathy presented Lymington’s captain Luke Ansell with the Chris Sirl Memorial Trophy. Sway plan to keep Chris’s memory alive by holding a similar fixture every year. Thanks to the availability of our lush Jubilee Field pitch, Sway begin their comeback into the Hampshire league with a run of home games against Andover Lions, AFC Petersfield and Michelmersh & Timsbury. The first game is on 15th August. See Fixtures/Results for details. Sway FC is pleased to announce the appointment of our new U18 management team of Ben Howlett, Luke Hirst and Chris Jackson. All three are currently studying for their BA Hons in Football Studies at Southampton Solent University, and all are Saints Foundation coaches. Ben, who will be joining us immediately, is an FA level 1 & 2 coach and has a L3 Diploma in sport studies. Luke is currently coaching in the USA and will be joining us at the start of the season. He is an FA level 1 & 2 coach, an FA level 1 goalkeeping coach and is an FA level 7 official. He also manages Botley U13s, is part of the UK Elite Soccer and Tecnico coaching staff and is working towards a UEFA B coaching badge. Chris is currently coaching in the USA before coaching on a P&O cruise. He will be joining us at the start of the season. Chris is an FA level 1 & 2 coach, an FA level 1 & 2 goalkeeping coach and is part of Premier Coaches staff. Sway FC thank former manager Rob Mathews for recommending our new management team. In preparation for our first season in Hampshire Division One, Sway FC have set up some interesting friendly games to get the new squad ready for a match-winning start. First up we welcome Weymouth Reserves to Jubilee Field on Saturday 4th July at 3pm. Other teams coming to play on our excellent-looking pitch include Lymington, Ferndown, Bournemouth Electric and Bournemouth Sports. The game against Lymington will be the first time we compete for the Chris Sirl Memorial Cup. A loyal supporter and great friend of the Club, Chris sadly died at the end of last year. Saturday 1st August: Bournemouth Sports 1st Team and Reserves. The Club bar will be open to refresh supporters and players at all our home games. See Fixtures/Results for a complete fixture listing. Further fixtures for Reserves and First Team to be announced. Sway have drawn last year's Premier League champions Hamble Club in our first foray into the Hampshire Puma Engineering League Cup. Last season "the Villagers" lost only five games; so a tough start for our lads. And they will be keen to win having been knocked out by fellow Premier team Clanfield in the first round last season. The date of the game has yet to be announced. Rob Mathews and Danny Aston leave their posts as U18s managers. The club thanks them for all their efforts over the past season and wishes them all the best in their future footballing careers. Dan is currently coaching in America and Rob is moving onto a coaching role at Basingstoke Town FC. Rob will be around for pre-season to help in the transition to the new management team. The club will be meeting prospective candidates in the next week. If you are interested in the U18 management vacancy please contact Paul Nineham at p9ham@btinternet for further details. The U18's completed their final fixture of the season with a defeat against league champions Gosport Youth, but finished a credible fifth in their maiden season in the Hampshire League. Sway are already planning for next season & included several Sway Junior U16's in their ranks, with Charlie Weekes in outstanding form. Any potential U18 players looking to play at our award winning pitch in the Hampshire Youth League can contact the interim manager for more information about pre season. With several players absent, Sway U18s took the opportunity to introduce Charlie Weekes, Max Benson, Ben Bateman and Asa Drodge from Sway Juniors Under 16s. The game also saw, utility man, Ben Haffenden donning the gloves with no recognised goalkeeper available. In an even first half both teams played entertaining football - a credit to both clubs. But it was Falcons who scored first and they took this one goal lead into the half time break. The second half continued as per the first until the home side lost all shape for a ten minute period. Falcons took advantage of this lapse to score a further three goals in quick succession. Sway recovered their composure and played some attractive football which resulted in Asa Drodge scoring the consolation goal to cap his 'man of the match' performance. Ferndown quickly took control at Jubilee Field, scoring early goals leaving Sway 4-0 down at the break. But the Reds came out stronger in the second half, putting some pressure on the Ferndown goal. Whilst three more goals were conceded, Sway fans were heartened by another goal from player-manager Dan Marks, his fifth in three games. The defeat leaves Sway poised to finish bottom of the Bournemouth Premier League. And with the Reserves propping up the Division 1 table, the 2014/2015 season is certainly one to forget. Now the focus is on rebuilding the squad for next season's campaign in Hampshire Division One. Manager Dan Marks and Tom Linbourne notched again for Sway in this bottom of the table clash. The Reserves completed their fixtures with a 3-1 home loss to fourth-placed Poppies. In an even first half both sides looked to play good football with Poppies looking the more dangerous. Darren Clark in the Sway goal made two excellent saves to thwart the visitors. However, Sway were unlucky not to go take a half time lead after U18 James Langdown pounced on a poor back pass to fire against the post. Ten minutes after the restart Sam Quinn scored for Sway from a superb free kick, fully 25 yards out. But with Poppies still creating chances, the young, inexperienced Sway side came under increasing pressure to hold on to their lead. Unfortunately, they could not; as with 15 minutes remaining Poppies equalised from a goal mouth scramble and then punished the tiring home defence with two further strikes. Dan Marks made a dream start to his player-manager role at Sway, posting a hat-trick in an emphatic win at Parley. A brace from new signing Tom Limbourne plus one from Dan Fairhurst secured this impressive result. Sway FC have been given the go-ahead to enter a team in the Hampshire Football League Division 1 sponsored by Puma Engineering. Despite our poor performance in the Bournemouth Hayward Premier League, the impressive facilities at our Jubilee Field ground together with our good record in previous season has caused the League Management Committee to look favourably on our application. The move is fully backed by our new management team of Dan Marks and Nathan Lucas and will enable us to attract quality players to blend with our home grown lads. Playing in Hampshire Division 1 will require some extra travelling with teams in the current division as far afield as Petersfield and even a team called Infinity! Yet another brace from Aidan Lacy provided some respite in a difficult game that saw two Sway players sent off. Rhys Whitcombe got the third for the Reds. Sway FC have appointed Dan Marks and Nathan Lucas as joint managers of the Senior side from immediate effect. The Club agreed with much regret to part company with Martin Spiers who, despite his efforts, did not achieve his plans to strengthen the squad. Dan and Nathan will bring in some new players for the final three league games and have irons in the fire to build a competitive squad for next season. Sway FC would like to thank Martin for his commitment whilst at the Club and wish him success for the future. The Reds put in an improved performance at Jubilee Field making second-placed Manor wait till near the end of the first half for their first goal. Two more followed either side of the break before Adam Gates was sent through to score a consolation goal for Sway. It was a bad day at the office for our Under 18s who couldn't find their passing game against the high flying visitors. Two goals in the first half and four in the second without reply completed a bad weekend for Sway FC. With both teams playing the league leaders of their divisions it was no surprise that this turned out to be a bad day for Sway FC. Having not lost all season, Electric were too strong for our lads. The only consolation was a late goal for Jack Keen who somehow netted with a precise lob after being put through by Matt Hillyar. At Jubilee Field, the Reserves started strongly, creating an early chance. But with the wind behind them Pennington took control and broke through twice to take a 2-0 half-time lead. Sway went further behind in the second half. However, marshalled by veteran Paul Nineham, the Reds began to show more resilience and nullified the visitors' slick passing game. Several chances were created before Sway deservedly scored late on through Under 18 Rory Martin. The Under 18s put in a good first-half performance under the lights at Fawcetts Field and deserved to take the lead through Ben Haffenden following a number of promising attacks. Strong defending kept the Hampshire Division 2 side at bay and gave Sway a half-time lead in this friendly match. But New Milton came out with more determination in the second half and soon drew level. Sway now had to fight a rear guard action and conceded a further three goals including a penalty. Aidan Lacy gave the visiting fans some cheer in the cold evening, virtually walking the ball round the 'keeper to make the final score 4-2. A brace from Aidan Lacy and a third from Glen Corbin gave the Under 18s a hard fought league win at Winchester. At 0-0 Sway were reduced to ten men when Harrison was dismissed. But Corbin put Sway ahead with his first goal of the season following a goalmouth scramble. Sway soaked up the pressure but Castle equalised through a well-placed volley from a corner. Aidan Lacy then stepped up with two goals. The first from a 25 yard free-kick; the second a cute finish following a one-on-one tussle with a Castle defender. The win avenges a 2-0 defeat at Winchester back in September and, together with the 2-0 win at Jubilee Field in October, gives Sway six points from the their three league games. With just six teams in the league the fixtures have been extended so that teams play each other three times. Lacy has netted six times this season, bagging a brace on three occasions. Sway were second best in this bottom-of-the-table clash at Jubilee Field. Merley went ahead just after Sway's best move was thwarted with a fine save to tip the ball over the bar. The game was effectively over just 20 seconds into the second half as the visitors breezed past Sway's defence straight from the kick off. Merley celebrated their first points of the season but are still propping up the league and four points behind Sway who are level with Christchurch Reserves on seven points. U18s Aidan Lacy & James Langdown made their first team debuts. Two goals from Sam Molyneaux were not enough to prevent Parley from knocking the Reds out of the Pickford Cup. after several minutes of injury time, Sports grabbed the win with the last kick of the game. The first game of the year got off to a difficult start when Matt Smith had to leave the field early on after a heavy tackle. But Sway regrouped and competed well against the fourth-placed visitors. The Reds deservedly went ahead when Liam Roberts was put through and neatly slotted past the oncoming 'keeper. Sway's defence held strong against the wind until disaster struck just before time when our centre-back had to be helped off after stretching to prevent a corner. Sports scored directly from the resulting corner to level the score at half time. The visitors came back out in determined fashion and soon took the lead. With two more players leaving the field through injury, Sway went down to ten men and Sports took full control of the game scoring two more goals to win it 4-1. The Reserves were unfortunate to come away from their final game of the year with nothing to show for it after an entertaining match away to Allendale. They went behind after 20 minutes and struggled to find any rhythm in their play. Sway equalised against the run of play when a fine run and cross from skipper Tom (Cruyf) Ritchie was headed home by Charlie Prince. Allendale retook the lead just before half time to lead 2-1 at the interval. Sway came out much stronger in the second half and took complete control of the game. They equalised for a second time when Ollie Read headed home from a corner and then created several good chances but were thwarted by an inspired goal keeping performance from the Allendale keeper. Sway Football Club are pleased to announce the appointment of Martin Spiers as First Team Manager. Martin joins us from neighbours Bashley FC where he was interim manager in the Southern League Division One South & West. Martin has managed AFC Burseldon, Lymington Town Reserves, Bashley Reserves and Bashley First Team. Martin's playing career included Hartley Wintney, Fareham Town, AFC Totton, Arundel, Littlehampton and New Milton Town. Bournemouth Electric p﻿﻿rovi﻿﻿ded a footballing lesson at Jubilee Field and outclassed the Reds for most of the game. The half-time score of 0-4 rapidly became 7-0 after the break, after which Sway rallied and, with help from Ben Ettridge in goal, managed to restrict the visitors to single figures. After going behind to a contentious penalty at Kings Park, the Reserves fought back to level the score at half time, after under 18 Ben Haffenden ran through to beat the 'keeper one on one. A flurry of goals in the first 15 minutes following the re-start saw Sway twice concede their lead. Firstly, Haffenden latched on to an excellent left-wing cross from Prince before Westover drew level after veteran Paul Nineham misjudged a high ball. Then Haffenden was brought down in the box after rounding the 'keeper and duly claimed his hat-trick from the spot. Westover's equaliser was eventually overturned after Haffenden ran on to a Waller through-ball to score his fourth. But the points were only finally bagged after Nathan David cleared a late chance off the line to give the Reds a much needed victory. Honours were even at a freezing Jubilee Field as both sides battled hard with neither side creating firm chances in the first half. The visitors made the break through in the second half with an unstoppable shot from outside the area. But Sway drew level as Ben Haffenden surged in from the right and fired into the net. With their tails up, Sway began to find their passing game and went ahead when Josh Thompson found space on the left and slotted past the keeper's left. However, Ringwood were not going to lie down and their pressure led to a penalty for a foul tackle which was duly despatched to earn them a draw. Sway now have ten points from their opening seven games and are second in Division 3. The Reds finally posted their second league win of the season with a great performance at Kings Park. Ollie Read put them one up after just five minutes but Westover responded to go 2-1 ahead. Steve (Fudge) Hillyer headed in from a corner before Matt Smith's long range-shot found its way into the goal. Sway went further ahead when the ball was handled from a corner and Smith made no mistake from the spot. In the second half, Sway soaked up the pressure with goalkeeper Ben Ettridge rescuing Sway on several occasions with some outstanding saves. In a tricky game away at Holt, the Reserves battled well and had majority of possession in the first half but failed to create any clear-cut chances. Straight from the second-half kick-off, Holt took the lead by capitalising on some sloppy defending. Sway then had to push forward, chasing the game, and were twice caught on the break to allow Holt to score two more. Sway got a consolation with five minutes remaining when Under 18 Ben Haffenden ran through to beat the keeper at the second attempt, scoring his first senior goal. The Reserves were still able to take positives out the game with Under 18 James Langdown having a particularly impressive game in defence. After conceding early on at Jubilee Field Sway fought back in the second half, drawing level after Liam Roberts' free kick eluded everyone. And, whist not dominating the game, could have gone ahead with several clear cut chances. But luck was not on our side as mix-ups in the home goalmouth gifted Westover a 3-1 victory. But the Reds will travel to Westover next week knowing that we have the capability to avenge this defeat. Once again the Reserves were struck by player shortages and fielded a bare eleven with veteran player-manager required to put in another sterling appearance. But despite going down three nil the lads were able to take some positives out of the game with some pleasing performances. With the first team's away game called off the Reserves were able to call upon the services of player-manager Ben Johnson. Ben put Sway ahead in the first half with a half volley but some sloppy defending allowed Burton to score three first half replies and take command of the game. But the Reds were much improved in the second half with Under 18 James Langdown impressing on his senior debut. The game finished 4-2 with Johnson scoring a second from a corner with a bullet header. Two goals from Josh Thompson plus one from Brad Simpkins earned Sway a fourth successive league win. Goals from Ben Haffenden and Josh Thomson gave Sway an excellent league win against Winchester Castle who beat the Reds by the same scoreline in the away fixture back in September. With nine points from six games Sway are moving up the Division 3 table. Sway got off to a comfortable start with an early goal from James Chilcott and soon went further ahead when Matt Hillyar ran in from the right and slotted past the advancing 'keeper. But the second half was a different story as Burton resumed with much greater intent and were soon on level terms. But the introduction of the late arriving Bill Stride made the difference for the Reds as he added the cutting edge to our attacking moves. He restored the lead before Chilcott made it 4-2. However, Burton continued to threaten and pulled one back to make it 5-2. But Bill had the last laugh and claimed his hat-trick with a tap in to put Sway into the last 16 with an away tie against either Pennington or Parley. Sway FC regret to announce that, following mutual consent, Tony Knowles is stepping down from the First Team Manager position. The Club would like to thank Tony for his commitment over the past months and wish him much success for the future. In the interim, the team will be run jointly by First Team players Adam Gates, Ben Johnson and James Totczyk. The reds earned their second league win of the season against a well-organised Christchurch Sports at Jubilee Field. Ben Haffenden put Sway ahead early on after Aidan Lacy and Cornwell combined well to put him through. Brad Simpkins added a second thanks to some tricky footwork at the edge of the box. Lacy made it three shortly before half time, rounding two defenders before firing home. The visitors came out with more determination in the second half and soon broke through from the left to pull one back. With the pressure on, Sway continued to attack and went further ahead when Lacy alluded three defenders down the left before deftly lobbing the keeper from an acute angle. Christchurch added a second with a precise volley but Sway defended resolutely to secure the three points. The win brought some cheer to Sway supporters this weekend following the first team's 3-1 Cup defeat to first division Bournemouth Poppies Reserves and the Reserves' 7-0 battering to Bisterne United at Jubilee Field. History was made today when Sway U18's recorded their first victory in their maiden season in the Hampshire U18 league. Ben Haffenden scored a hatrick, 24 hours after making his senior debut for the reserves, Aidan Lacy scored a brace with an own goal wrapping up all three points. Well done to all players, and managers Rob Mathews & Dan Aston. The Under 18s put in a competent performance against a young but energetic Gosport Falcons but ended up loosing their opening league fixture 3-0. Gosport went ahead after a fine passing move forced Sway's 'keeper and man-of-the-match, Ryan Gates, into action with an elegant stop that unfortunately parried the ball to the Gosport striker who tucked it in. The Falcons scored again just before half-time from a 20 yard shot that flew into the top left corner. Following the half-time team talk the Reds played far more comfortably, keeping possession for long spells but creating few chances. The game was put beyond reach when a clever one-two down the right wing led to a pinpoint cross and a neat finish at the back post. Sway's best moment came just before the final whistle when Aiden Lacy's 25-yard strike sailed over the Gosport bar. With the squad hit by two weddings and a raft of injuries this was always going to be a difficult game. The only bright spot was a late reply from Jamie Chilcott to make it 7-1. Laurie Symons, Tom Braime, George Briggs, Jamie Chilcott, Ben Johnson, Sam Quinn, Tom Ritchie, Matt Smith, James Totczyk, Jon Waller, Liam Welton, David Goth, Matt Hillyar. In a close contest with both sides playing some decent football, Sway were undone by two goals in three minutes early in the second half. In an even first half, neither keepers were troubled, with Liam Welton making the most opportunities for Sway with some good runs from midfield. After going behind, the Reds wasted several good chances before James Totczyk beat the visitors' 'keeper with a powerful header. Darren Clark, Paul Stevens, Steve Hillyer, Joe Hodge, Liam Welton, Dan Fairhurst, Ben Johnson, Matt Smith, James Totczyk, George Briggs, Adam Gates, Luke Baker, Sam Quinn, George Edwards. Sway are pleased to announce the appointment of Tony Knowles as First Team Manager. Tony has significant experience in football management and will be assisted by Club stalwarts Ben Johnson and Adam Gates. Tony's football career began in Essex playing for Canning Town, Romford FC and Ilford FC. After joining the Army he represented his squadron and later on played for Warminster Town. His first move into management was as player/coach at Bracknell Town where he later became Reserve Team Manager. Next was Henly Town starting as Reserve Team Manager before moving up to First Team Assistant Manager. Thetford Town saw Tony as Club Coach then last season he was at Cheddar FC as Reserve Team Manager. Sway's season finally got going with an impressive 6-1 win over Bashley Reserves at Jubilee Field. Bill Stride got the pick of the goals with a wonderful angled shot from the left to score Sway's third after he had opened the scoring on ten minutes. Under 18s star Tom Dymond put in the second while a deft backward flick from centre-back Prichard made it 4-0 at half time. In the second half George Edwards was soon amongst the goals but Bashley quickly struck back from the restart, surprising 'keeper Michael Tang with a shot from the half-way line. The impressive Jamie Chilcott finished the rout to make it 6-1. At Tuesday's Hampshire Under 18s League meeting, Sway were given a home draw in the League Cup against Moneyfields from Division 1. The team's last met in the 2011/2012 season when the Portsmouth side won 7-0 at their ground in the Hampshire Cup. The league fixtures were also confirmed at the meeting, beginning for Sway on 7th September with an away game at Gosport Falcons. The Reds face a difficult fixture in the Hampshire Intermediate Cup with an away draw at Hampshire Premier League outfit Overton United. The north Hampshire side, who finished 7th in the league last season, will entertain Sway First Team on 4th October. Meanwhile, Sway Reserves, who also qualify for the Intermediate Cup, have drawn a bye. Sway FC is pleased to announce the appointment of Daniel Aston and Rob Mathews as joint managers of the club’s talented under 18s side. The duo have plenty of coaching qualifications and are currently studying for their BA Hons Football Studies at Southampton Solent University. They will be officially taking over in late August as they are coaching for Cheltenham Town FC Community Programme for the next few weeks. After a frustrating pre-season when nearly every friendly was cancelled for one reason or another, Sway look forward to entertaining Portcastrian in their opening league fixture. Last season the sides shared the points, with Sway loosing 2-1 at home back in March but taking all three points in the away fixture last September with a 2-1 win. ﻿Hampshire FA have commended Sway Junior Football Club for their successful implementation of defibrillator at Jubilee Field. The Juniors, who run teams from Under 7s to Under 16s and have been the source of many players at Sway FC, led the way in arranging for the purchase of a defibrillator for the benefit of all the users of Jubilee Field (the Tennis club, Cricket club and both the Senior and Junior football clubs) with the cost being shared. The idea was put to the Parish Council and they agreed to house the defibrillator and give a grant towards the cost. The defibrillator should be in position for the start of the coming football season and will benefit all users of the ground and pavilion including visiting players and spectators. All team managers will be trained in its use although it will be the latest automatic type which requires little intervention. Sway suffered a big defeat in their opening game against a well-organised Sholing. But the lads showed a great attitude and some good individual performances. Something to build on in the next game. All committee members agreed to stay on at Sway FC's Annual General Meeting leaving Tony Plumbly at the helm as Chairman supported by Rod Clark, Secretary and Colin Mantle, Treasurer. Ron Loveless continues to provide leadership as our President. The Club continues to look for a new first team manager. Regrettably next week's friendly with Lyndhurst has been cancelled. Sway FC regret to announce that manager Stuart Doling has had to stand down before the season begins due to business commitments. Stuart and his assistant Matt Dunford had begun to build a bright future for the club and were working well with both players and club officials. But Stuart has had to give priority to his new business which is taking up most of his time. Now the club are seeking an "experienced individual or management team” to fill the hot seat at the first team, which plays in the Bournemouth Hayward Saturday League’s Premier Division. Charley Dukes clinched the Salvage Cup for Sway Under 18s cooling firing low past the Hedge End Rangers 'keeper after Sam Roberts deftly turned the defence in the centre of midfield to put Dukes in on goal. Earlier, Sway went ahead with a somewhat soft penalty after Rob Linsley was brought down by the Hedge End number one; top scorer Tom Dymond firing home the spot kick. But the large Sway following at the Testwood Stadium, Totton, had to bite their nails as Rangers scored on 85 minutes. But the Reds held on to claim the trophy giving them a league and cup double after the league confirmed that the recent 1-1 draw from rivals Sholing would stand despite the match being abandoned in the second half due to a serious injury, leaving Sway with an unassailable lead. Well done lads and management team Matt Dukes and Chriss Rashleigh.